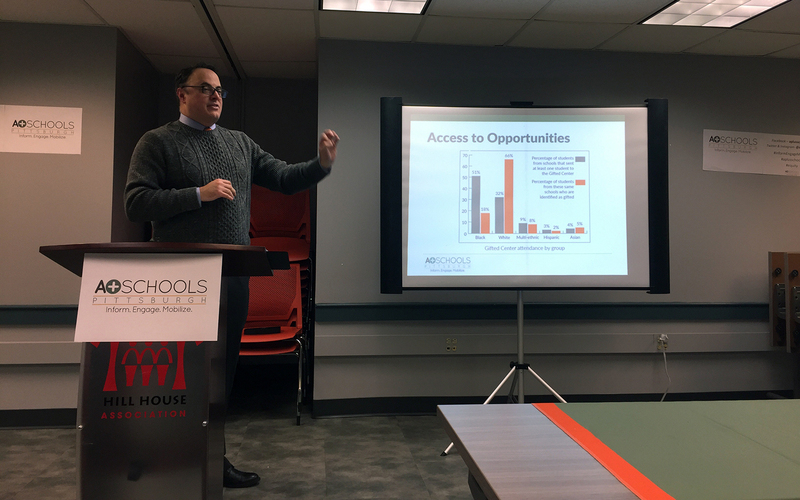 James Fogarty, executive director of the A+ Schools advocacy group, delivered this information as part of the group’s annual report to the community on Monday at the Hill House. Despite an overall decline, black students are five times more likely to be suspended than white students. The report points out that black students make up 53 percent of the student population, yet they accounted for three-quarters of students suspended at least once. While third-grade reading scores have increased, 29 percent fewer black students are proficient in reading compared to white students, Fogarty said. Third-grade reading proficiency is significant because it marks the transition from when students learn to read to when they read to learn. PublicSource reported in September on the significant racial achievement gaps between black and white students in the Pittsburgh schools based on the 2017-18 Pennsylvania System of School Assessment [PSSA] and Keystone Exams. And when it comes to college readiness, the gap persists. The data shows a difference of more than 40 percentage points between black and white students in meeting SAT college-ready benchmarks. Fogarty pointed to an enrollment increase of 234 students last school year. While modest, the numbers put an end to a trend of downward enrollment over the past several years. 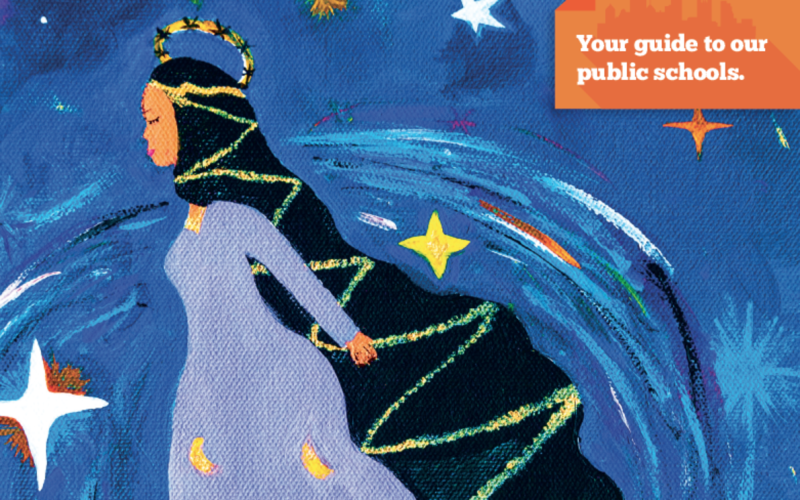 Hamlet attributed the increase to parents re-enrolling their students in Pittsburgh schools. However, he said the district has not yet been able to determine if students are returning from charter or private schools or homeschooling. The report showed that reading proficiency rates for black third-grade students increased from 37 percent in 2015-16 to 46 percent in 2017-18. White students scored about 30 percentage points higher than black students in 2017-18. Proficiency in third-grade reading “sets the stage for success,” Fogarty said. He pointed to Pittsburgh Weil PreK-5 in the Hill District as a positive standout with 62 percent of black students hitting reading proficiency targets in third grade. Fogarty said math scores across the board for Pittsburgh students were poor in the 2017-18 school year. On the PSSA exams, 76 percent of students in grades six through eight, or about 3,800 students, did not test to grade-level standards, which could impact their ability to take higher level courses. Fogarty said the ability to take algebra I by eighth grade is important because it will give students access to college-preparatory math by the time they leave high school. In the 2016-17 school year, 37 percent of students took algebra by eighth grade. The percentage increased by 2 percent in 2017-18. Black students make up 53 percent of the total student population, but they accounted for only 35 percent who took the 2018 Keystone Exam in algebra I. White students represent 33 percent of students, but 49 percent of those who took the algebra Keystone. Students take the Keystone Exams in literature, biology and algebra at the end of the respective course. Of all the students who took the Keystone Exam in algebra, 68 percent of white students scored proficient or above, as compared with 33 percent of black students. The district’s students aren’t equally prepared for life after graduation. The Pittsburgh Promise provides college scholarship money to students with a GPA of 2.0 to 2.5. Among eligible students in 2017-18, 92 percent of white students and 70 percent of black students qualified. Throughout the district, 37 percent of white students were enrolled in Advanced Placement courses, as compared with 13 percent of black students. A nearly identical disparity existed between the races of students who were taking Centers for Advanced Study courses. Last school year, the Pittsburgh schools offered the SAT free of charge to all students for the first time. That year, 78 percent of white students hit SAT benchmarks in reading and 61 percent in math. For black students, those numbers were 34 percent in reading and 15 percent in math. The graduation rate increased 1 percent districtwide from 2015-16 to 2016-17. But the rates aren’t equal across the district. Four high schools increased their graduation rates, but the rates decreased at five high schools. Pittsburgh Westinghouse Academy 6-12 had a graduation rate of 66 percent, the lowest in the district. Meanwhile, Pittsburgh Science and Technology Academy had a rate of 98 percent. Hamlet said he was most proud of the increases the district has seen in black male graduation rates. Hamlet said that in the 2014-15, 57.4 percent of black male students graduated; the superintendent reported that 73.5 percent of black male students graduated in 2016-17. College completion rates are measured by how many students earn a bachelor’s degree within six years. The national average in 2017 for six-year college completion rates was 26 percent. The Pittsburgh district’s rate was 31 percent. But the statistics vary among schools. Pittsburgh CAPA 6-12 led the district with a 55 percent completion rate. Pittsburgh Westinghouse 6-12 had a rate of 8 percent, the lowest in the district. Chronic absenteeism applies to students who have missed 10 percent or more of school days, and it continues to be a problem in the district. However, the data shows slight decreases in K-8, middle and 6-12 schools. The rate is 46 percent for 9-12 schools, up 5 percentage points. But again, the data varies widely from school to school. The lowest absentee rate was at Pittsburgh Science and Technology Academy 6-12, which had a rate of 13 percent. The highest was at Pittsburgh Perry 9-12, which had a rate of 72 percent. According to the state Department of Education’s Safe Schools statistics for the 2017-18 school year, the number of suspensions dropped overall from the previous year, but black students continued to be suspended at the same rate as the previous year. The A+ report looked at suspensions but did not list this yearly data. The state numbers show schools issued 4,023 suspensions to students in 2017-18. Of that total, 3,149 of suspensions were issued to black students. For the 2016-17 school year, the district issued 5,862 suspensions. Of that total, 4,611 were to black students. The A+ report showed other subgroups are also disproportionately represented in suspensions. Students with Individualized Education Plans, created for students with disabilities, account for 21 percent of the student population but 31 percent of students suspended. Economically disadvantaged students represent 71 percent of the overall student population, but represent 88 percent of the students suspended. The A+ report did not look at expulsions. State data shows the district expelled more students in 2017-18 than it did in 2016-17. In 2017-18, the district expelled 219 students, of which 175 were black students. In 2016-17, the district issued 177 expulsions, of which 133 went to black students. Hamlet blamed the increase on the growing number of students caught bringing marijuana on school property, explaining that drug infractions warrant an automatic expulsion. He said the district has instituted a new drug and alcohol awareness program in the schools to reduce those numbers. Aside from test scores, the A+ report looked at the academic growth in individual schools. Even in some schools where students weren’t hitting proficiency targets at appropriate rates, the data showed they are still making at least a year’s worth of academic progress. Fogarty commended five schools for exceeding a year’s worth of academic growth in both math and English language arts. They are Pittsburgh Arsenal 6-8, Pittsburgh Schiller 6-8, Pittsburgh Southbrook 6-8, Pittsburgh Lincoln PreK-5 and Pittsburgh Colfax K-8. 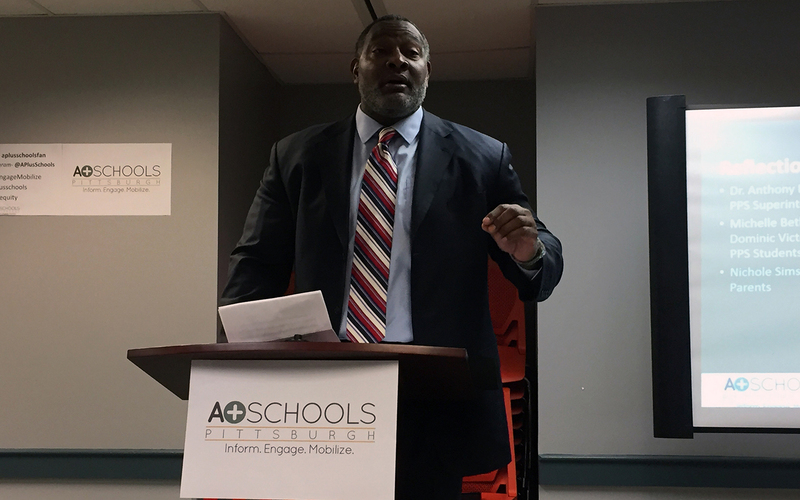 Hamlet commended A+ Schools for its annual report and said it coincides with his efforts to provide transparency. “I think it’s really important that A+ has the data, that we have the data, that the public has the data,” Hamlet said. He referred community members to the district’s website, where a dashboard of district data is being built.